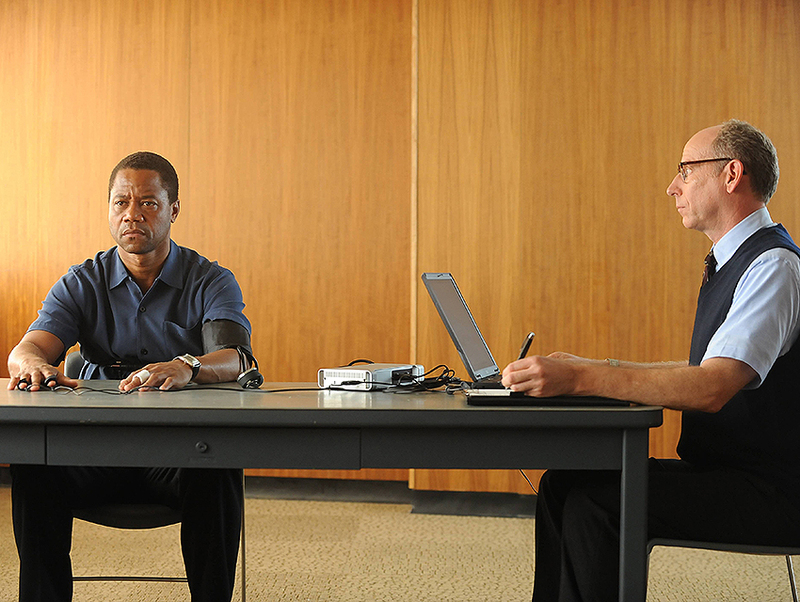 The gripping FX miniseries The People v. O.J. Simpson comes to a close this week, and to be honest, I don’t know what I am going to do with the void in my Tuesday nights. I thoroughly enjoyed the ten-week ride, which (of course) included tracking down the show’s many filming locations. Here’s a round-up of some of the more notable spots featured on the series. The actual Tudor mansion where O.J. lived at the time of the murders was razed in 1998 (shortly after the football great was evicted due to foreclosure), and a large Mediterranean-style home was subsequently built in its place. So producers had to look elsewhere for a pad to portray that of the Juice (Cuba Gooding Jr.). They managed to find a manse that closely resembled his former dwelling at 1006 North Rexford Drive in Beverly Hills. Both the interior and the exterior of the property were utilized on the series. The Mediterranean-style condo where Nicole Simpson was found brutally murdered during the early morning hours of June 13, 1994 was extensively remodeled after being sold in 1996, so producers recreated its exterior in exacting detail, including the tiled walkway and front gate, in the driveway of a home located at 917 South Bundy Drive in Brentwood. Interior scenes were filmed at a Mediterranean-style condo very closely resembling Nicole’s located just around the corner at 11978 Mayfield Avenue. The sprawling, ranch-style home where Marcia Clark (Sarah Paulson) lived, chain-smoked, attempted to find respite from the grueling “Trial of the Century,” and shockingly dropped a few F-bombs is located at 3314 Club Drive in Cheviot Hills. The landmark Beverly Hills restaurant located at 344 North Camden Drive, which was originally established in 1974, is where Robert Shapiro (John Travolta) is dining when he receives an urgent phone call from O.J. asking him to be his lawyer. Nicole’s funeral, where Kris Jenner (Selma Blair) admonishes Khloe (Nicolas Bechtel) and Kourtney (Isabella Balbi) for fooling around, takes place at Hollywood Forever Cemetery’s Chapel of the Psalms, located at 6000 Santa Monica Boulevard in Hollywood. The cemetery is the final resting place of countless celebrities, including Rudolph Valentino, Cecil B. DeMille, and Marion Davies. It is also a popular filming location and has appeared in productions like Dexter, Californication, Wicked City, and L.A. Story. The dwelling that appeared on the series is the real deal. Filming took place in the actual contemporary pad where Robert Kardashian (David Schwimmer) lived in 1994 and where O.J. hid out in the days following the murders when media scrutiny became too intense at his own abode. To re-create the infamous slow-speed Bronco chase, producers shut down a mile-long stretch of the southbound section of Interstate 710 near the Hellman Avenue overpass in Alhambra. The dramatic sequence took a full two days to complete. The “Northern California” home belonging to Christopher Darden’s (Sterling K. Brown) father, where the endearing prosecutor watches the slow-speed Bronco chase unfold with his neighbors, can actually be found at 8573 Robert Avenue in Sun Valley. The stately pad where Shapiro lives with his wife, Linell (Cheryl Ladd), on the series can be found at 718 North Elm Drive in Beverly Hills. Ironically, it is located just two doors down from the site of another of L.A.’s most infamous murders, that of Jose and Kitty Menendez, aka the real life “Nightmare on Elm Drive” case. Robert Kardashian counsels his children on the dangers of fame while celebrating Father’s Day at the Chin Chin restaurant located at 11740 San Vicente Boulevard in Brentwood in the episode titled “The Dream Team.” According to series creator Scott Alexander, the Kardashian clan did indeed celebrate Father’s Day 1994 at Chin Chin in real life, though he speculates the meal most likely took place at the Studio City outpost, which would have been in closer proximity to Robert’s Encino home. The lavish, two-story space serving as Robert Shapiro’s law office can be found on the 37th and 38th floors of SunAmerica Center, a towering, postmodern skyscraper located at 1999 Avenue of the Stars in Century City. When Robert Kardashian arrives at Kris Jenner’s house to pick up his kids for a visit in the episode titled “The Dream Team,” Kris confronts him about the fact that he is standing by O.J. Her Spanish-style pad, which also popped up in “A Jury in Jail,” can be found at 4804 Topeka Drive in Tarzana. While in jail in the episode titled “100% Not Guilty,” O.J. reminisces about happier times when he partied like a VIP at a hip club with Robert Kardashian. Filming of that scene took place at SBE’s popular Greystone Manor nightclub located at 643 North La Cienega Boulevard in Beverly Grove. Though the site is currently closed for renovation, it is said to be re-opening in September. In “100% Not Guilty,” Robert Shapiro unceremoniously announces to F. Lee Bailey (Nathan Lane) that his work on the “Trial of the Century” will be pro bono while dining at this quaint French-inspired bistro located at 631 North La Cienega Boulevard in West Hollywood. Vanity Fair journalist Dominick Dunne (Robert Morse) regales friends with tales from the courtroom while at a dinner party in the episode titled “The Race Card.” The scene was filmed in one of L.A.’s most opulent homes, The Doheny Mansion located at 8 Chester Place in University Park. The historic and oft-filmed property, which was originally built in 1899, is now a part of Mount Saint Mary’s University’s Doheny Campus. In the episode titled “Marcia, Marcia, Marcia,” Johnnie Cochran (Courtney B. Vance) discusses taking down Detective Mark Furman (Steven Pasquale) with other members of the Dream Team over cocktails at The Prince Restaurant & Bar located at 3198 ½ West 7th Street in Koreatown. The red-hued eatery was originally established in 1949 and remains one of L.A.’s most popular filming locations, having appeared in everything from Chinatown to New Girl. Darden invites Marcia to Oakland for the weekend to attend the birthday party of his childhood best friend, Byron (Sam Sarpong), in the episode titled “Conspiracy Theories.” The soiree scene, during which Marcia dramatically schools the group on the facts of the case, was shot in the basement bar of Hollywood Post 43 of the American Legion, which is located at 2035 Highland Avenue in the Hollywood Hills. The site is, unfortunately, only open to members of the American Legion and their guests. Though the actual Simpson jurors were put up at the Hotel Inter-Continental located at 251 South Olive Street in downtown Los Angeles (which became the Omni Los Angeles Hotel at California Plaza in 2000), on the series the jurors checked into the DoubleTree by Hilton Torrance, which can be found at 21333 Hawthorne Boulevard. F. Lee Bailey and Johnnie Cochran head to “North Carolina” with the hopes of impassioning a judge to force the release of the Mark Fuhrman tapes in “Manna from Heaven.” Filming actually took place a bit closer to home at the San Pedro Municipal Building located at 638 South Beacon Street. When preliminary judge John Reid (Joseph Culliton) announces he has to review the Mark Furman tapes before ruling on whether or not they can be admitted into evidence in “Manna from Heaven,” Cochran takes to the streets by holding a press conference at what is said to be Hill A.M.E. Church. The scene was actually lensed at the Mary Andrews Clark Residence located at 306 South Loma Drive in Westlake. The massive, oft-filmed structure was originally built as a YWCA in 1913 and today serves as low-income housing. Lindsay Blake is an actress, writer, celebrity admirer and Los Angeles enthusiast. Her true love is filming locations, and she founded the Web site IAMNOTASTALKER in 2007 to document her vast findings on the subject. For more “stalking” fun, you can follow Lindsay on Twitter, Facebook and Instagram.